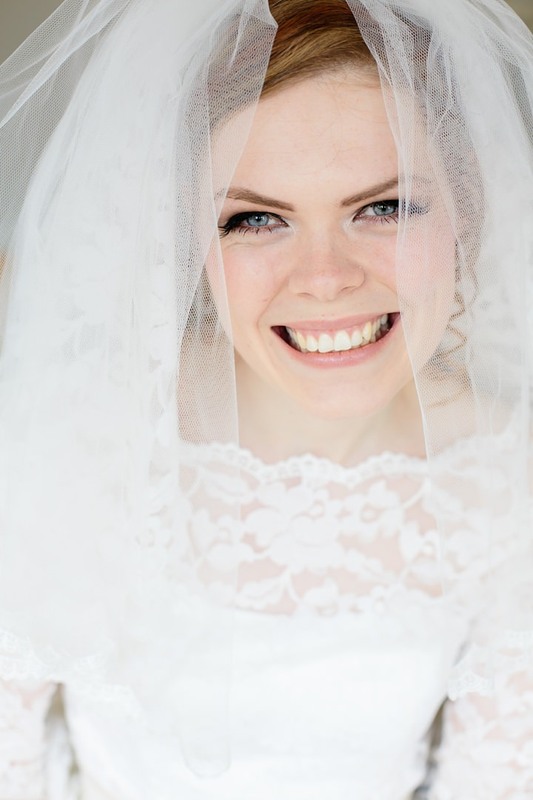 I am delighted to be able to share today’s wedding with you and if you are a regular to the blog you will recognise the bride as it is our very own Boho Bride Rachel. 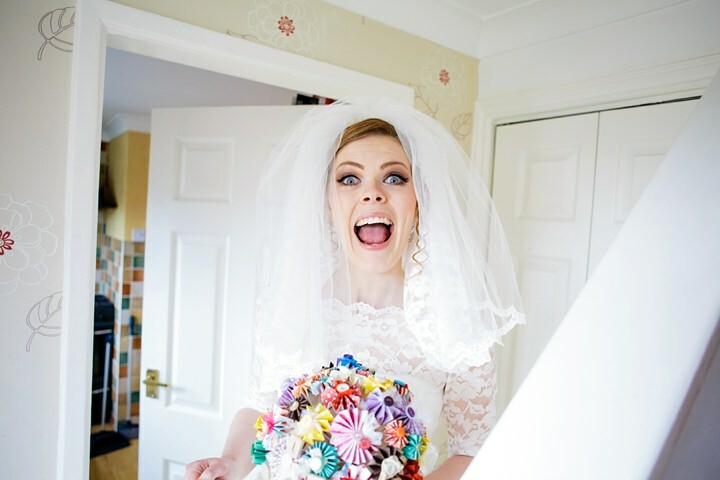 Rachel started writing for Diary of a Boho Bride a year ago and ever since then we have been following her DIY rainbow wedding story. 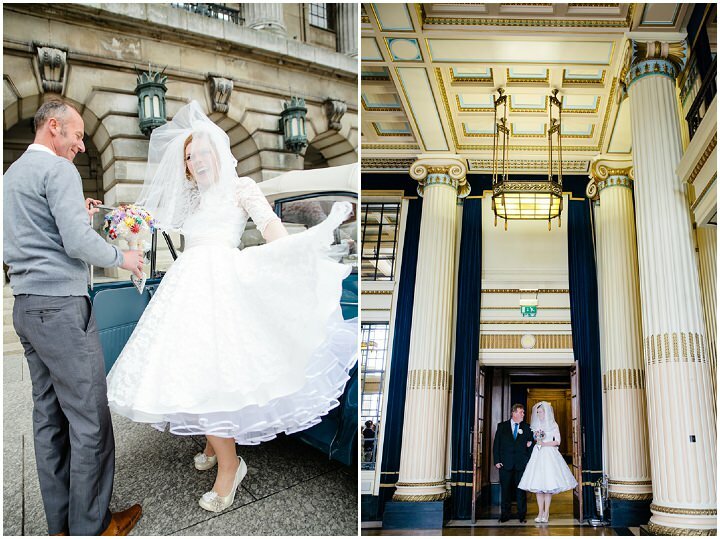 It has been a delight having Rachel on the Blog and I have to say her wedding really doesn’t disappoint! It’s AMAZING! 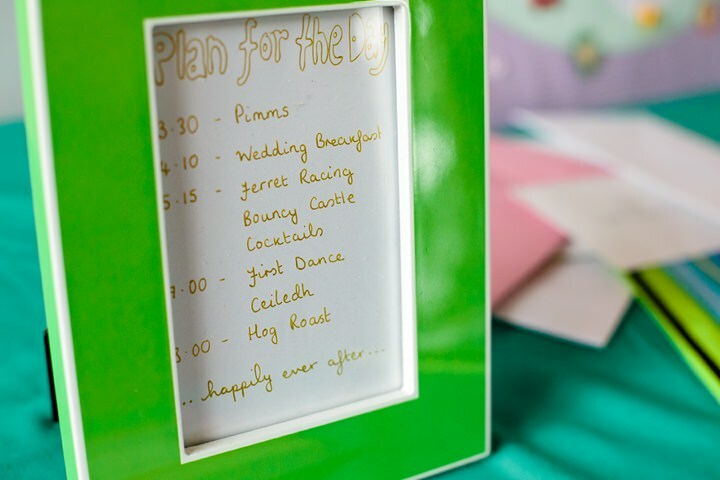 There are so many wonderful elements to this wedding it’s hard to know where to start! 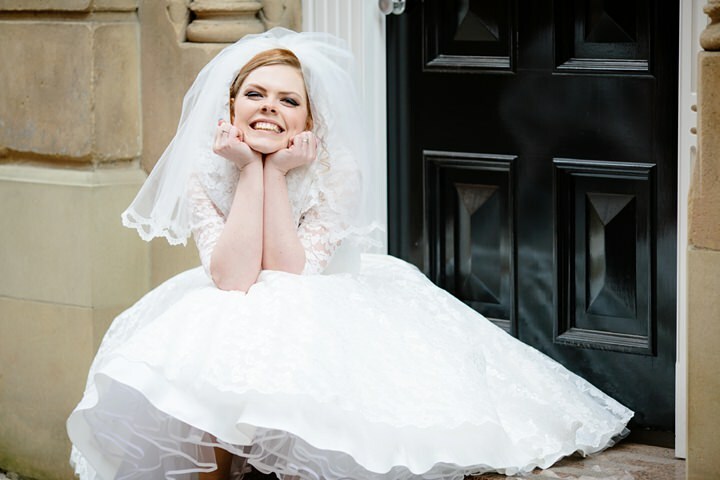 It’s bursting with colour, as Rachel filled her day with a rainbow theme, her Candy Anthony dress is to die for and she looks a knock out in it! 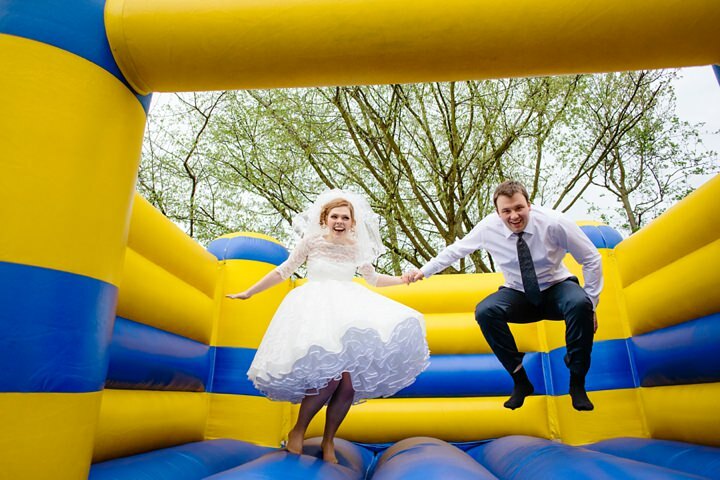 Add in ferret racing, a bouncy castle and a ceilidh for the entertainment, oh and did I mention that Rachel catered the whole wedding herself for 150 guests!! well as you can see this is one amazing wedding. But the thing that knocked me out the most and the thing that stands out a mile is Rachel’s infectious smile and sense of fun! Congratulations to Rachel and Philip on a fabulous day and well done to Tux and Tales for capturing it so well. We met in our first year of university in Nottingham and we celebrated our seventh anniversary the day before the wedding. Phil got down on one knee in snowy Bruges. I cried all over him and we both ended up covered in mascara. It was amazing. 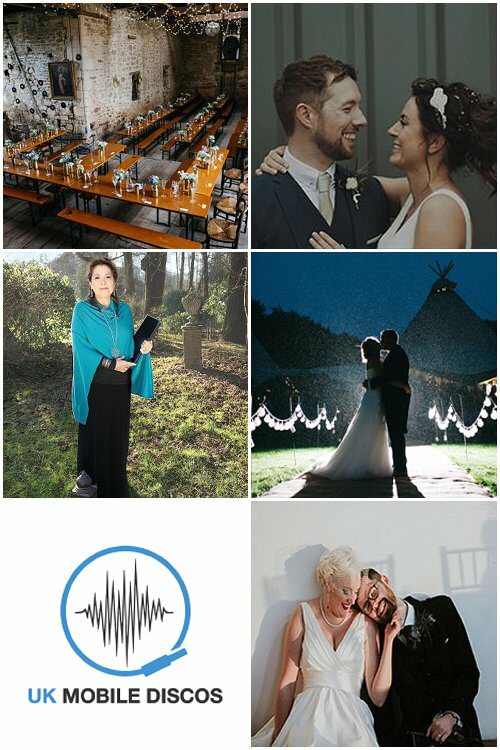 I scoured wedding blogs, clicking on every banner and side ad I could see. We looked at a few different sites and talked about what we liked and what we didn’t and the one we both loved (and love is important! Like isn’t enough!) was Tux and Tales. The deal was sealed after we had a consultation with Jaye and Matt. They were so enthusiastic about our ideas and we just really thought they were awesome people who we’d love to have around us on our wedding day. 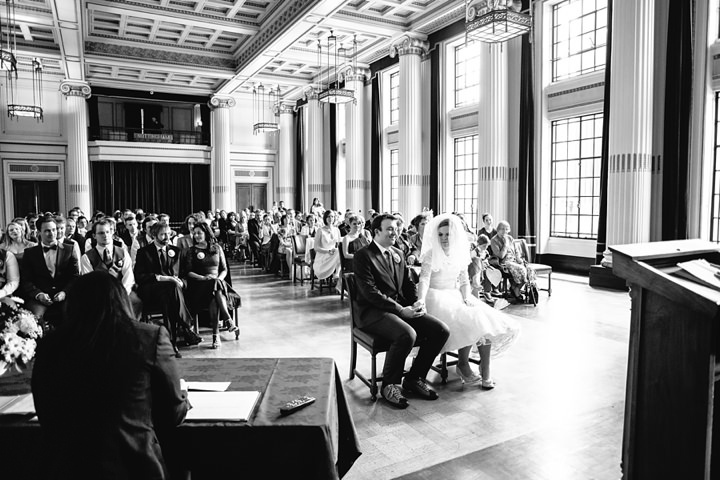 We absolutely made the right choice – our wedding photos capture the feeling of our wedding day perfectly. Basically, Jaye and Matt are magical wizard geniuses and I couldn’t possibly recommend them more highly. 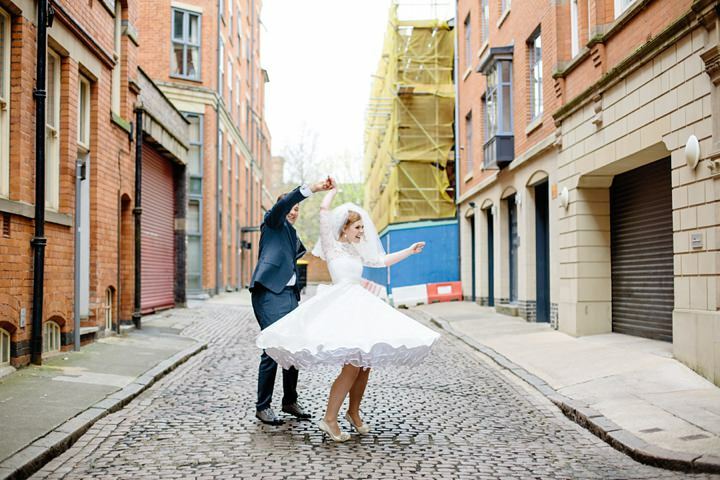 My dress was Candy Anthony – made with Nottingham lace, which was a happy coincidence and meant it felt extra special to have our portraits done in the Lace Market! My veil was also Candy Anthony. 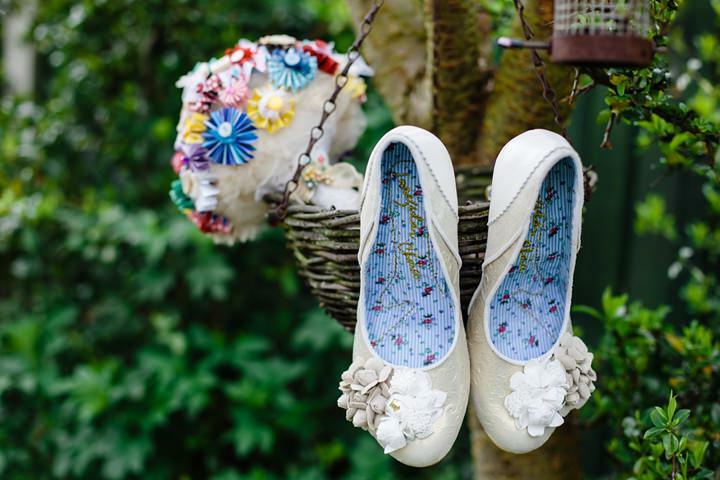 My shoes were Mrs Lower by Irregular Choice, my earrings were made to match my wedding ring by the Hairy Growler and my sparkly hair slide was from Glitzy Secrets. 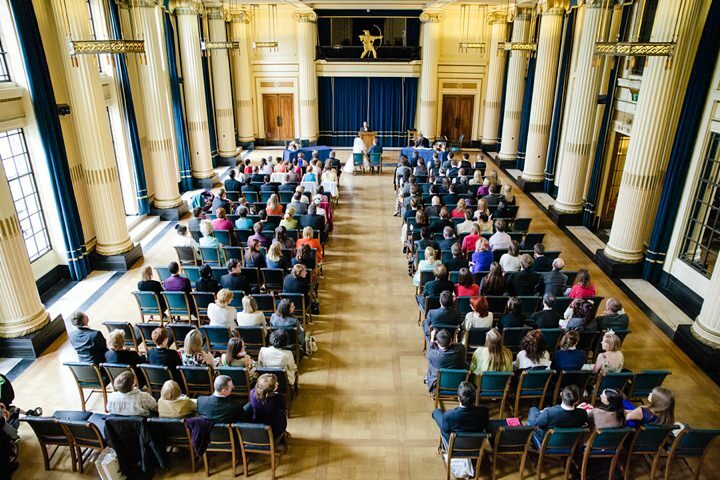 Phil’s suit and tie were Paul Smith – more Nottingham connections! 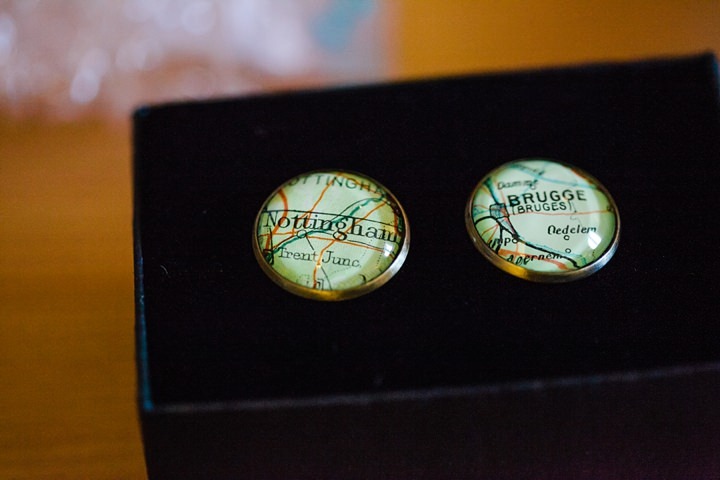 His shirt was bespoke, and his cufflinks were a wedding present purchased from Folksy. 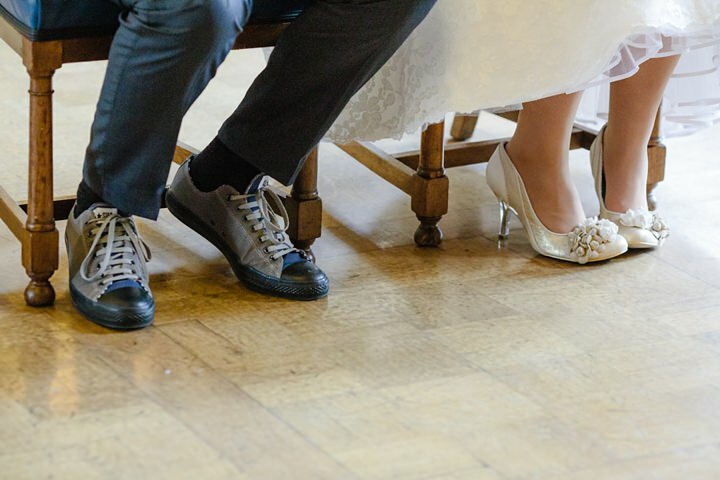 His shoes were custom Converse with our wedding date stitched in the back. The bridesmaids were each asked to buy a dress in their colour – I asked for knee-length-ish and floaty and let them do their thing. I think they all looked so beautiful, and individual – which I loved. 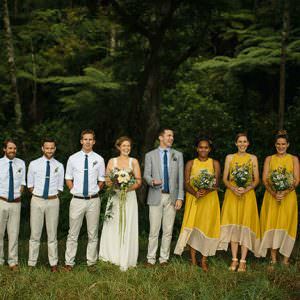 The groomsmen wore grey trousers and waistcoat with a white shirt, plus coloured Converse and a tie from Debenhams. My nephew, Harry, who was our page boy, had a rainbow bow-tie bought from Littlevys on Etsy. ALL the colour. There weren’t even enough colours in the rainbow for us so we worked with ten! 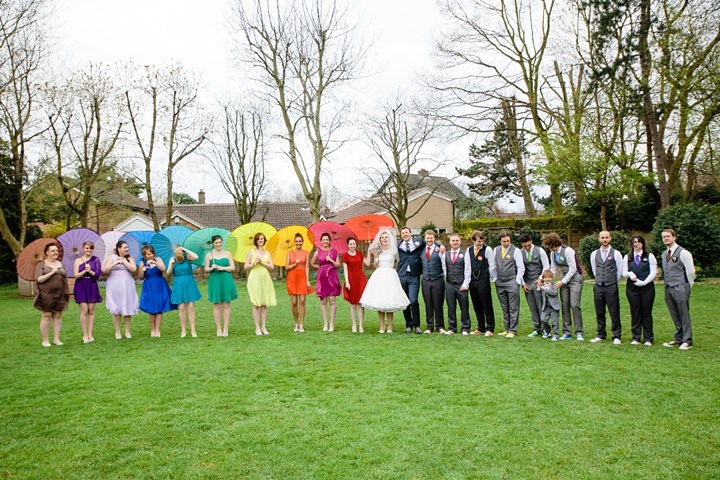 One per bridesmaid – red, orange, pink, royal blue, pale blue, lilac, purple, chocolate, green and yellow. There wasn’t a flower in sight. 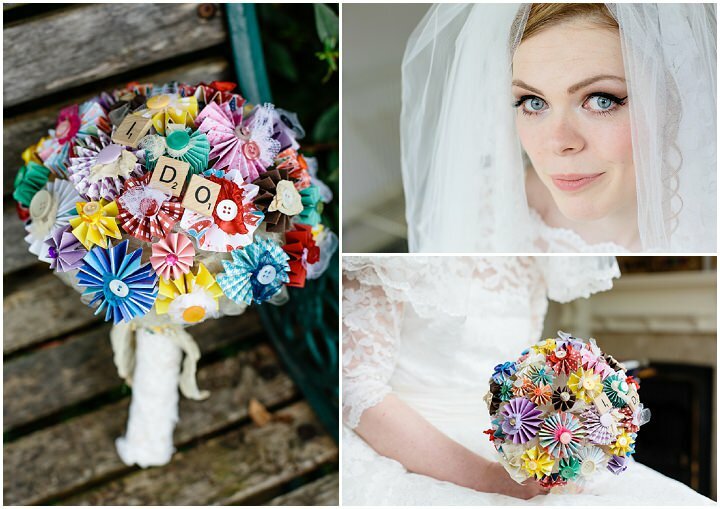 My bouquet was made of paper pinwheels by Topthiswedding on Etsy, and the buttonholes were made to match. 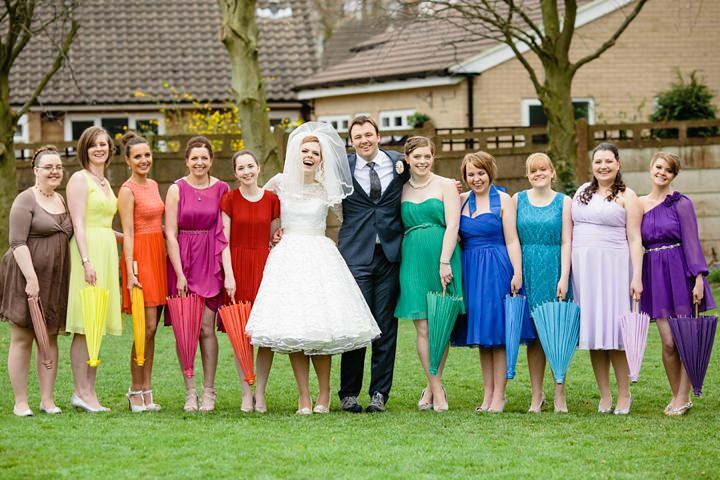 The bridesmaids carried paper parasols to match their dresses. All things we can keep forever. Paper lanterns strung across the ceiling in our ten colours. Handmade Mr and Mrs Van Krimpen bunting made by wonderful friends at BaccaCrafts. Table runners in ten colours. A photo wall of pictures from the very first one of the two of us together to recent snaps. Afternoon tea in place of a wedding breakfast. 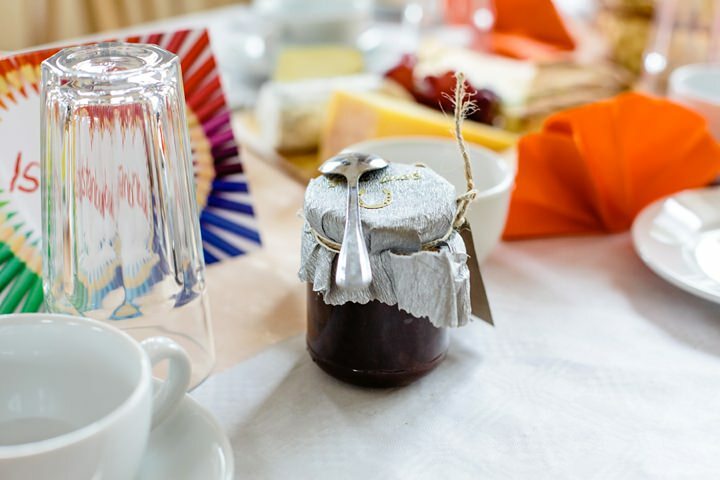 We had cheese and ham mini muffins, quiche, sage and ale sausage rolls, olive and rosemary focaccia, a glorious cheeseboard with crackers and chutney, chocolate brownies, Bakewell slice traybake, lemon drizzle cake, lemon tart, carrot cake and scones with clotted cream and strawberry jam. I made everything except for the carrot cake (my mum made that!) and the chutney (which my mother in law made) – and I’ll admit I didn’t make the cheese from scratch either. 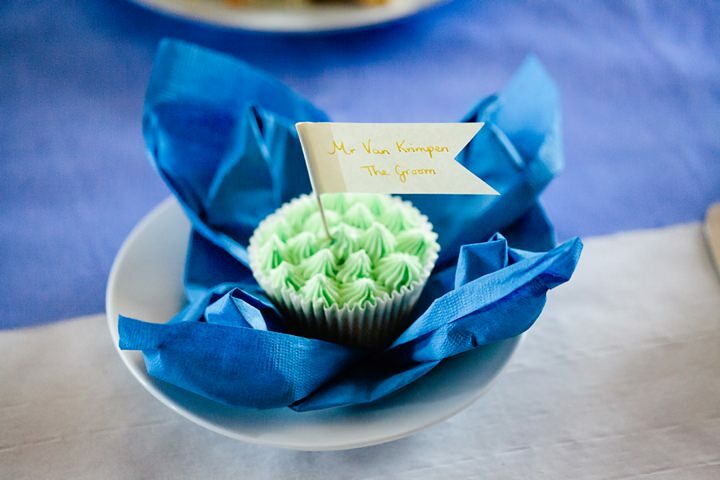 Our place names were on flags stuck into beautiful cupcakes made by Karen at Classy Cupcakes, who is a superstar. There was a candy buffet too, for which I’d made raspberry coconut ice, fudge, cinder toffee, Baileys truffles, rum truffles and salted white chocolate truffles. 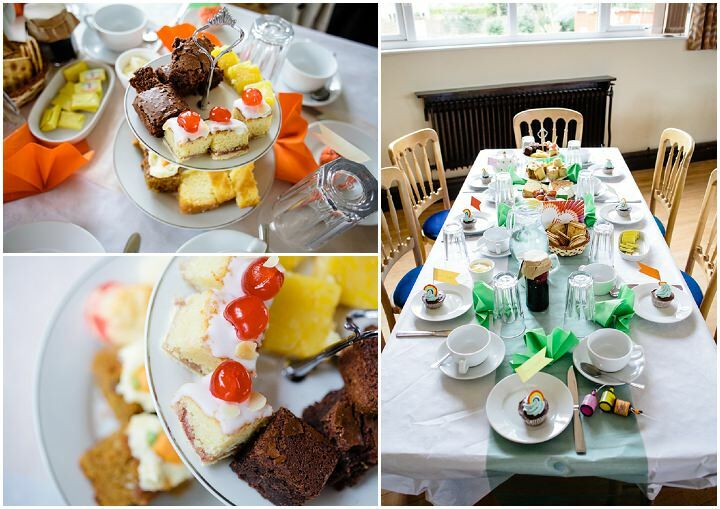 We’d topped it up with Smarties, Skittles, lollipops and Flying Saucers too. 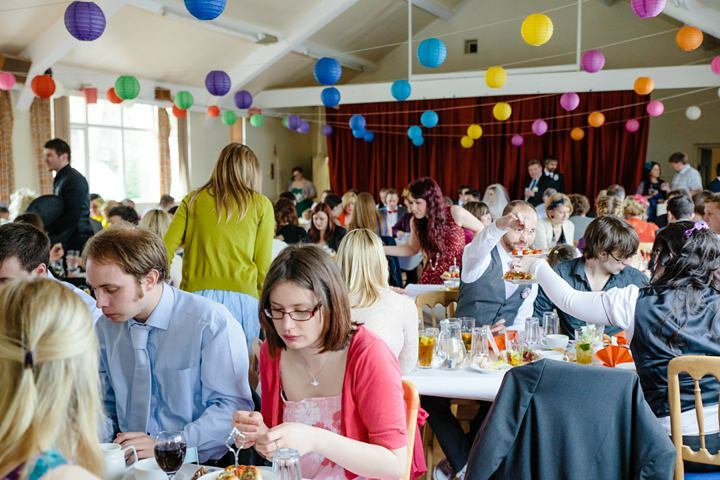 Catering your own wedding with 150 guests is the act of a crazy person, but I loved it and I was really pleased (and hugely relieved) with the results! In the evening we had a hog roast. I didn’t even see it, but I’ve been told it was the most delicious thing in the whole world. 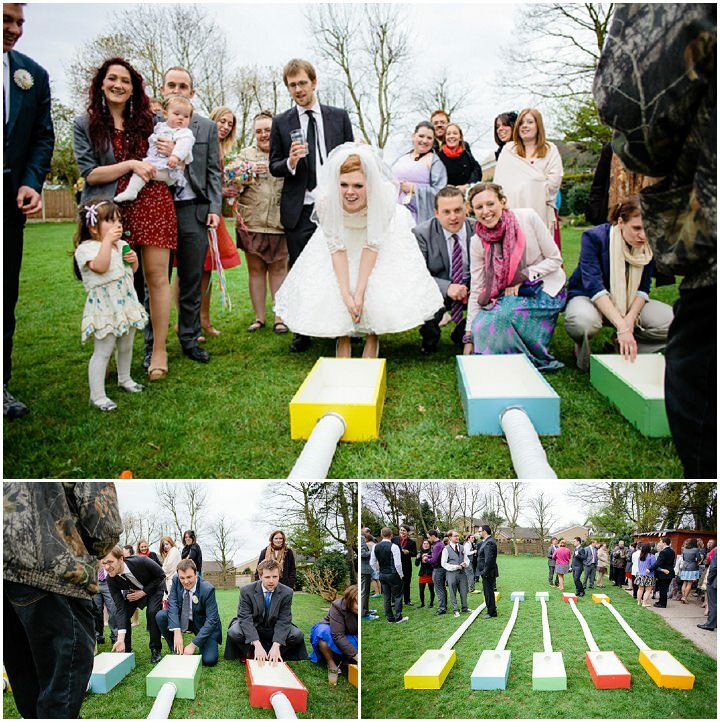 Ferret racing, a bouncy castle, a flair cocktail bar, bubbles, a pinata and a ceilidh. Okay, so the ferrets. Did you know ferrets love to race? 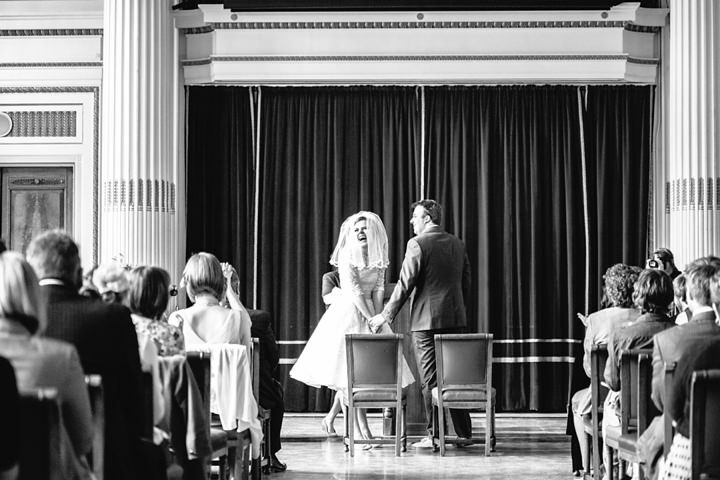 I had never heard of such a wondrous thing when it was dropped into conversation a couple of months into wedding planning, and I decided to check it out as a potential filler for that gap between eating and dancing. 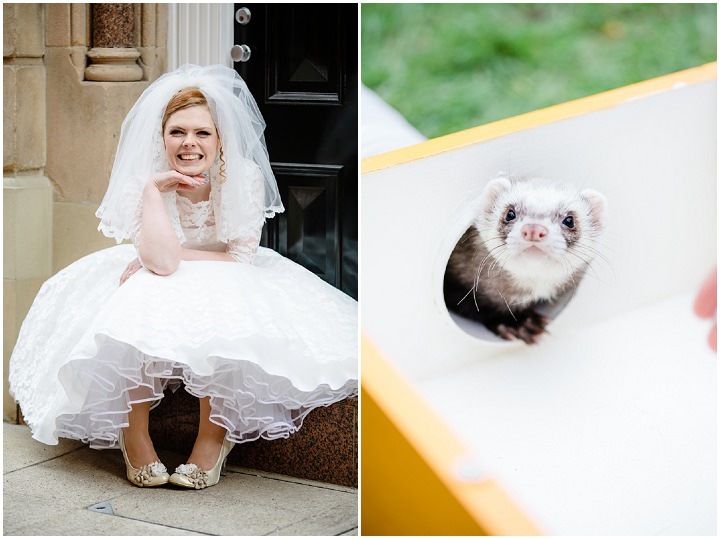 Our local ferret shelter were happy to attend – it was their first wedding! 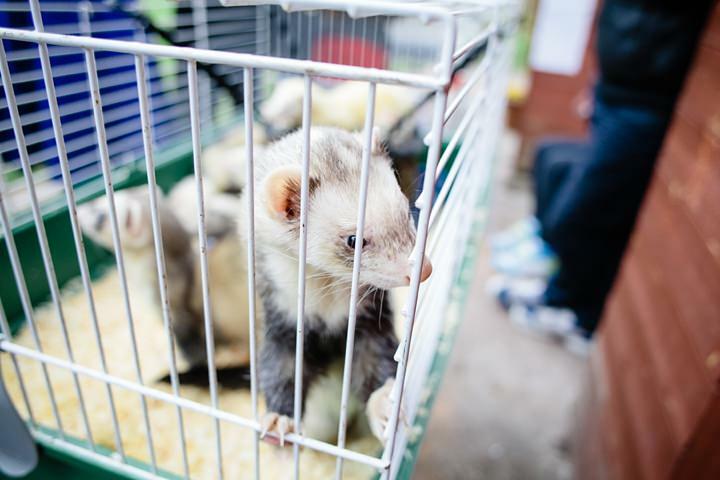 Ferrets are gorgeous and adorable, and ferret racing is top notch wedding entertainment. 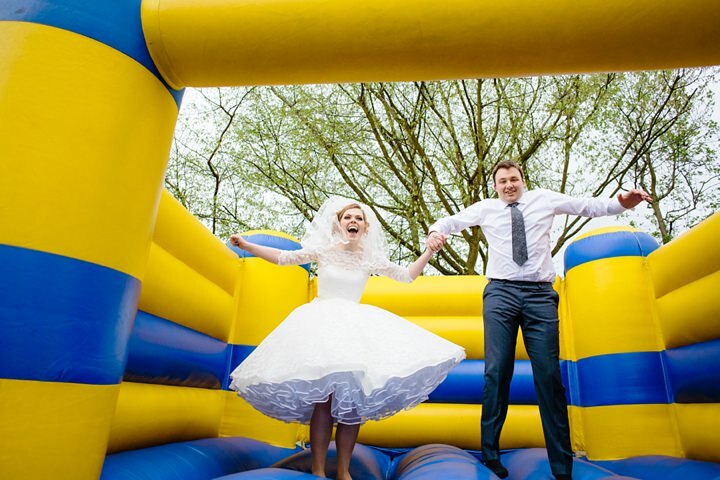 The bouncy castle was one of Phil’s absolute wedding priorities. The boy loves to bounce. So did our guests. 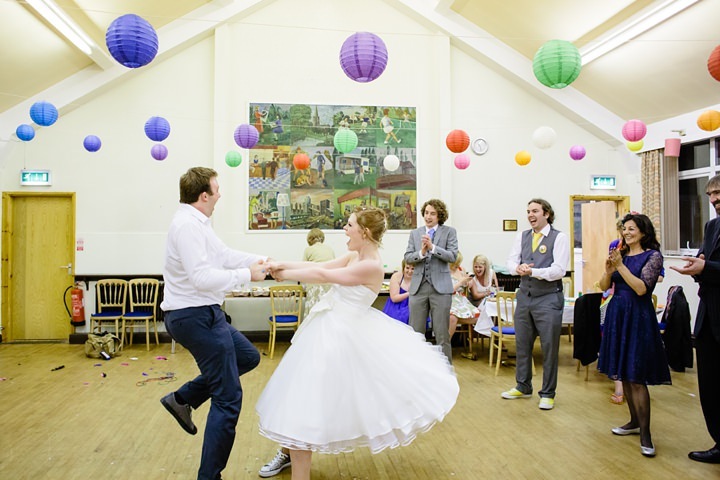 There was never any question of NOT having a ceilidh at our wedding. My mum’s side of the family beckons from Ireland and I grew up stripping the willow left, right and centre, plus I’m a massive folkie and love a bit of traditional music. It was a great giggle and I was glad to whip the sleeves off my dress and don sparkly Converse to dance the night away. We all forgot about the dragon piñata until the very end of the night, and in a fit of utter surrealism, our wedding ended with the beheading of a dragon, with its head being raised on a stick by victorious groomsman Dan. 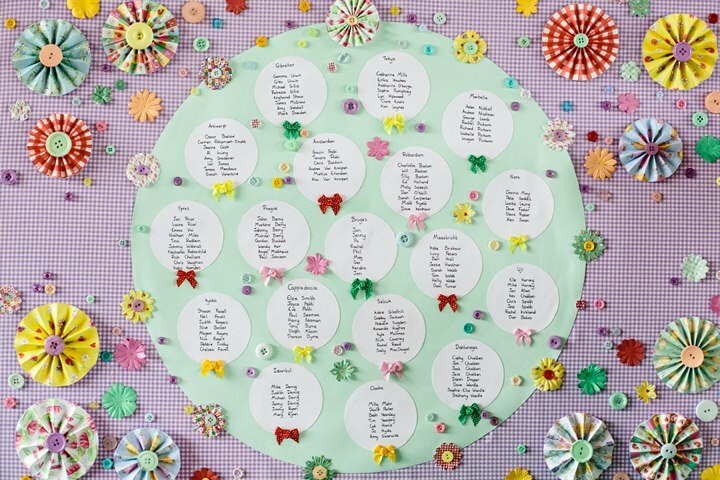 – Phil’s ludicrously talented groomswoman, Sarah made the fabulous pinwheel seating plan. 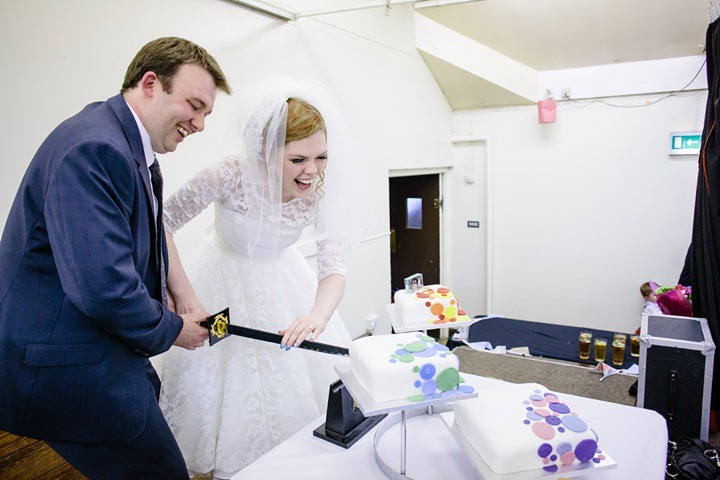 – Our wedding cake was made by our fabulous bridesmaid, Sarah, who is a baking goddess. It was amazing. My sister also made a groom’s cake with a walrus on top. – I made the rainbow ribbon wands. – I made some of the signs – the order of the day etc. – Everything was set up and decorated by the groomsmen and a select few ladies, under the organisation of my fabulous dad. 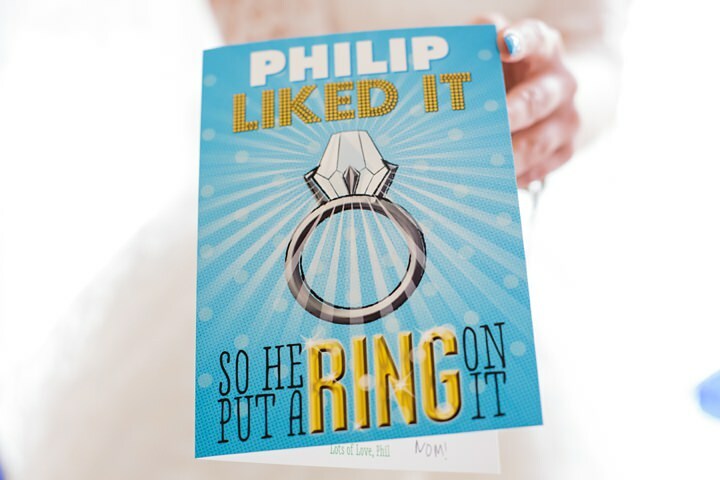 – The whole ceremony was just perfect – crying and grinning all the way down the aisle, seeing a little tear run down the boy’s face, the fabulous readings, the lovely music, the first kiss, and dramatically pretending to sign the register with Phil’s granddad’s pen. – Dancing in the streets of Nottingham. 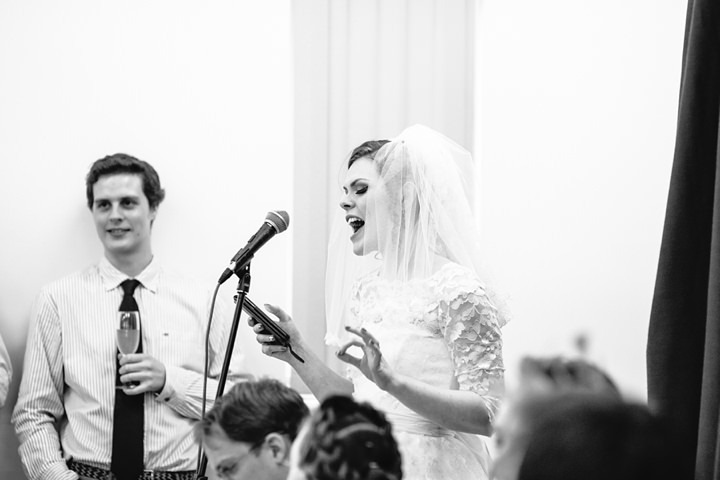 – The speeches were magical – my dad described me as a cross between Truly Scrumptious and Mary Poppins! I also gave my own speech which I’m really pleased I did and would definitely recommend to other ladies. – A special waltz in honour of my nanny who couldn’t be with us – everyone joined in, despite 99% of us having no idea how to waltz. 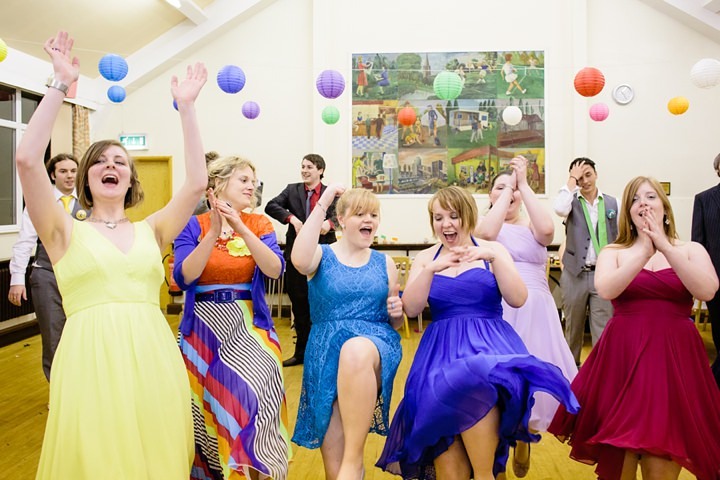 – The last dance, when everyone really got into it and had an absolute blast. 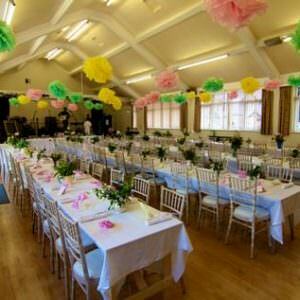 – Sitting on the floor with my husband as the hall was cleared around us by our gorgeous guests. Phil’s biggest surprise of the day was seeing my dress – I’d spent the last year winding him up about it and he’d somehow decided I would be in a red dress with a massive train, which is more or less the opposite. For me, the biggest surprise was first thing on the wedding morning when I found a huge bouquet of flowers from Phil as a wedding present. In seven years, he has never ever bought me flowers before, but goodness, he picked his moment! Cue the first happy tears of the day! – Lists, lists, lists. Lists of lists. I love lists. 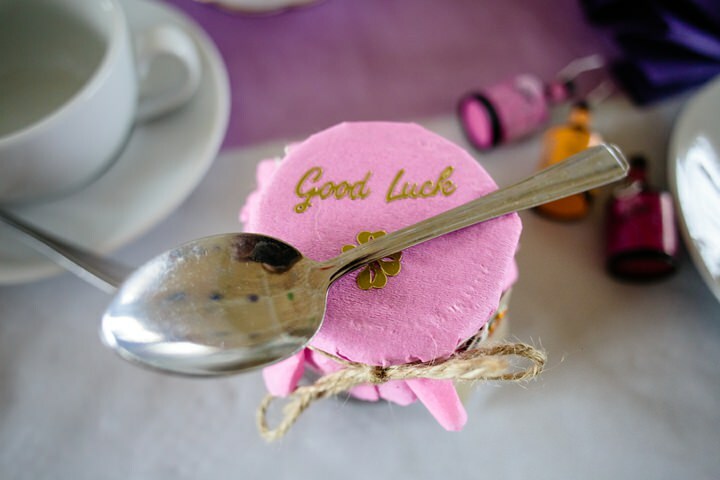 – Let go of things if they’re not fun – I dumped a few DIY projects that would have been beautiful but were more stress than they were worth, and nobody would have known any different! – Things will go wrong. You won’t give two figs as long as you end up married. – If things run to your carefully planned timings, it’ll be a miracle! It’s fine – nobody minds. – Don’t worry if you don’t manage a decent conversation with every guest if you’re having a big wedding – just go with the flow. – It took me 90 minutes to go from the garden to the loos to change my dress and remove my veil because of all the hugging. Do not try to go anywhere at speed!! – Hire ferrets. Seriously. They’re flipping adorable. 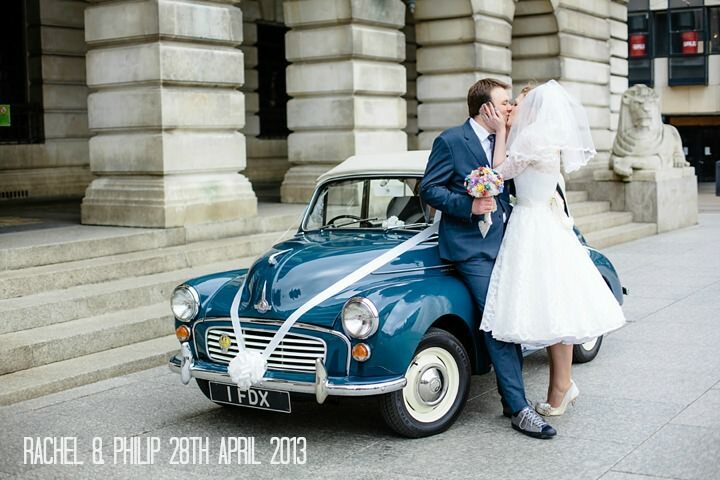 We LOVED photographing Rachel & Phil’s wedding. Such a happy, smiley, laid back couple! And c’mon….. FERRETS! Rachel has the most infectious enthusiasm! oooooohhhoohohohohohhooohhhh – TOO MUCH AWESOME!! 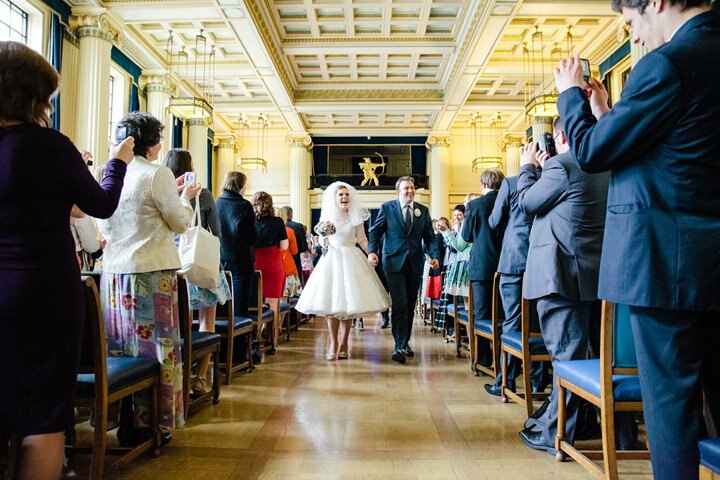 Thank you so much for sharing our wedding on your fabbity blog, Kelly. It’s been such a pleasure to be one of your boho brides! 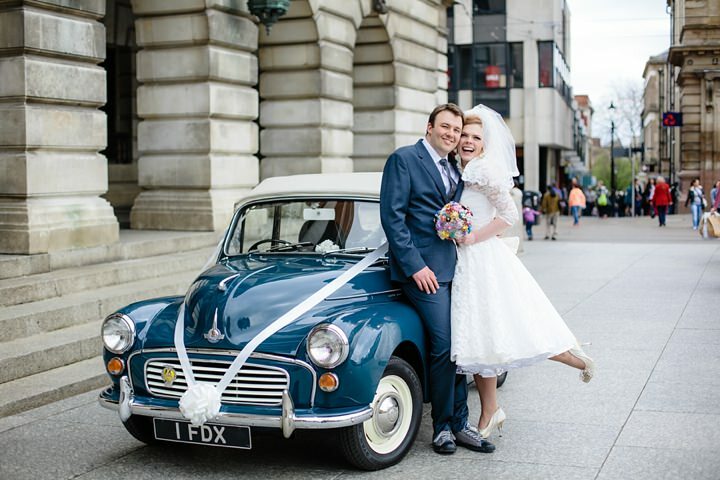 We had such a happy day, and I’m so glad people like Jaye and Matt’s magical fabulous capturing of the whole affair – we think they and their photos are the tops. Now that wedding looks FUN!!! WOW! I have literally died and gone to wedding heaven!! As a fellow boho bride, I have been following Rachel’s diary and getting more and more excited about her rainbow and diy wedding after each post i read and my gosh it is just stunning! Rachel, you look absolutely gorgeous! The dress is perfect, the photo’s are just beautiful and you can actually feel the atmosphere from them! Stunning! Wow! Totally wow! So much to say about this wedding but don’t know where to start. W. O. W it’s bloody awesome! George! Finally something other than the plain pink and gold or lace combo! Very refreshing to see your wedding. 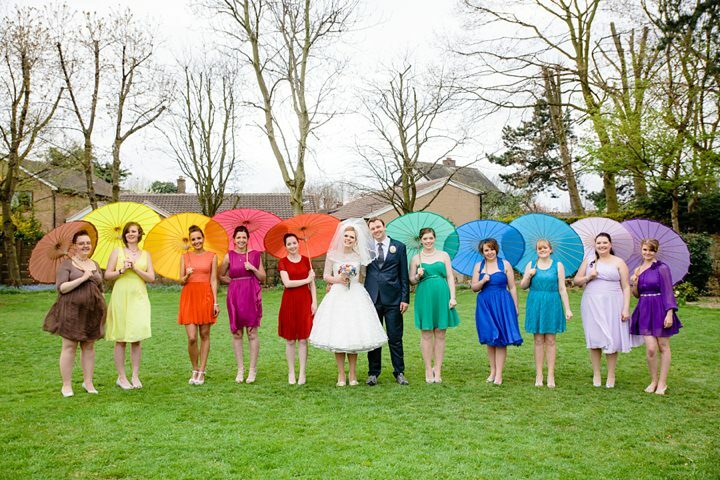 Hi, do you have any details about where ther parasols where purchased? 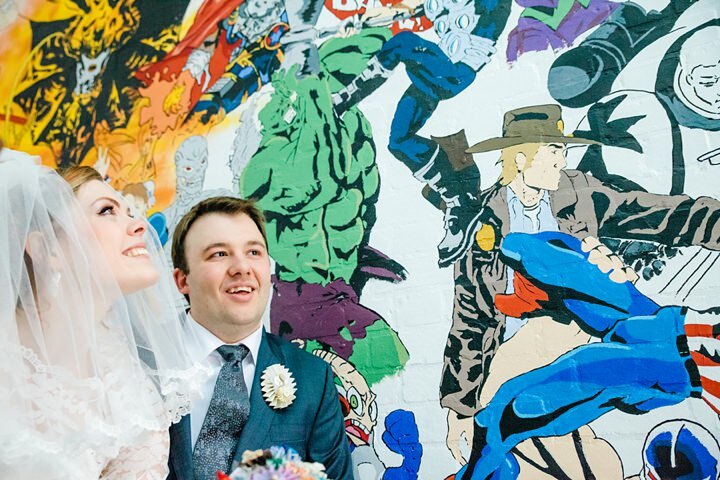 This looks like such a fun-filled happy-fest of wedding wonderfulness! 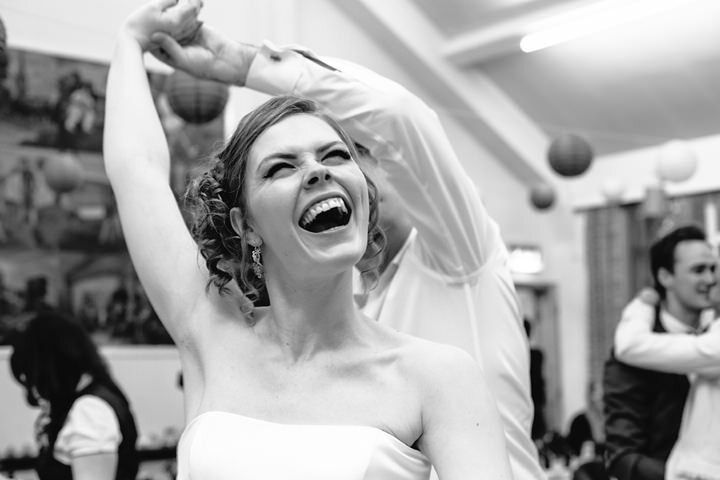 Rachel’s smile is infectious, you can tell it was an incredible day. I love everything about it!